View from Glascarnoch Dam looking towards the Aultguish Inn. Freezing temperatures made for treacherous road conditions yesterday as schools across the north and north east were forced to stay closed or open late. 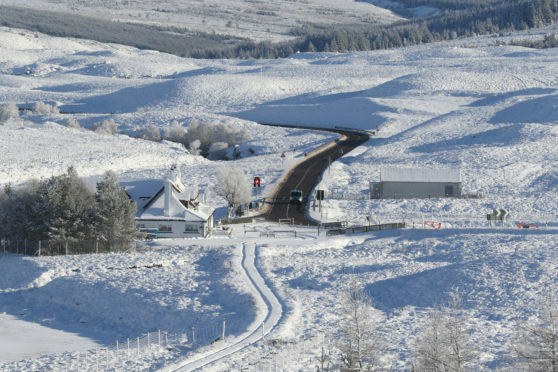 Braemar in Aberdeenshire experienced the coldest temperature in the UK overnight when the mercury plunged to -14.4C, the coldest it has been since 2012. In the Western Isles, pupils on Barra and Vatersay had their exams disrupted. Many students were unable to get to Castlebay School due to freezing temperatures creating treacherous road conditions in the morning. School buses serving Vatersay and the east side of Barra were cancelled. Meanwhile, parched villagers on Lewis have been witout water for a week. Upgrade works in Aird Tong involved laying a temporary network of pipes on top of the ground which ices up due to bitterly cold conditions. Engineers are deploying measures in a bid to resolve the issue. An amber snow warning was in place for a large part of the north east with blizzard conditions expected up until 9pm last night. And it was expected to get even colder tonight, forecasters warned. Helen Roberts, Met Office meteorologist, said yesterday: “I don’t think anywhere in the country got above 4oC today. It has been very cold across the board, despite the fact that there has been a lot of sunshine about. “The general forecast for Friday and Saturday is sunshine and showers with an emphasis on sunshine. There will be quite a lot of brightness around, showers will be mainly around the coasts and they will be wintry, a mixture of sleet and snow. “Overnight will be cold again, it could get even a touch below last night’s minimum. It will continue to be cold and frosty nights throughout the weekend with ice a risk, particularly where showers are falling in coastal areas. Police were advising drivers to travel with caution overnight and this morning. Areas likely to be affected by snow and ice include Aberdeenshire, much of the Highlands and Islands including Orkney and Shetland. Severe road conditions closed eight Highland Council Schools and five nurseries yesterday. Six schools opened late. In Argyll and Bute, Luing Primary School was closed as a result of the surrounding road conditions.